I love being one of the “older sisters” in the Christian blogosphere. Reading about other writers’ young children brings back sweet memories of when mine were that little. It also gives me the opportunity to occasionally bring in the “been there, done that, here’s how I would go back and do it better if I could” perspective. And that’s what I’d like to share with you today. I wish I had realized as a young mother that once you start a Christmas precedent, or fail to start one, it can be really hard to change later. Looking back over 20+ years, here are some Christmas traditions and precedents I would go back and change, and others I’m glad we started early and kept. 1. I wish we had minimized gifts. Instead of showering each child with several gifts, large and small, I think I would either do one “large” gift plus stockings (candy and dollar store type items), or two to three small to moderate gifts, plus stockings, per child. Not only does limiting the number and price of gifts cut down on the holiday “gimmes” so you can refocus Christmas on Christ, but there are a couple of practical reasons this can be helpful. First, if your family is still growing, you may end up with too many children (we have 6) for multiple gifts to be financially feasible. Second, family finances aren’t foolproof. Your husband could lose his job. You could decide you want to be a stay at home mom instead of working. Anything could happen. If your kids are used to tons of gifts every year, a financial setback will make Christmas disappointing. 2. I wish we had given more experiences and fewer material gifts. We’ve all bemoaned the kids getting a toy they’ve BEGGED for for months only to play with it for a few days and tire of it. Not only that, but toys can take up a lot of space. And think back to your own childhood. What do you remember and appreciate more, the material gifts you received, or the memories of spending special time with your family? Plus, experiences can be spaced out over months and weeks and can be enjoyed all year long (and they don’t even have to be wrapped!). How about giving each child a calendar for the new year with things penciled in on certain dates? An afternoon at the skate park. A day trip to the aquarium. Lessons he wants to take. Mother-daughter mani-pedis. A family outing to a local festival. Making cookies together. It gives everyone something to look forward to. 3. I wish we had done Advent. I’m a lifelong Southern Baptist, and, not to sound too old and codger-y, but, in my day, we really didn’t do Advent (a lot of SBC churches still don’t). I was in my 30’s before we began attending a church that even did Advent candles on the Sundays leading up to Christmas. And I was in my 40’s before I became aware of all the wonderful devotionals and worship activites available for families to enjoy together during the Christmas season. Nightly family worship is a great way to bring the focus of Christmas back to Christ. 4. I wish we had “rescheduled” our December baby. Don’t get me wrong here. I would still have my son, just in January, if possible, instead of December. Of course, pregnancies can be unpredictable, and babies are a blessing no matter when they arrive, but, looking back, when we were trying for my son, I would have taken March “off”. As anyone born between Thanksgiving and New Year’s can attest, birthdays around the holidays tend to get lost in the shuffle. It is extremely difficult to schedule a child’s birthday party in December and have anyone attend because everyone is already committed to Christmas parties, family activities, and traveling. December birthday presents and parties also add to the expense of the holidays. 5. I’m glad I did a yearly Christmas newsletter. I started doing this the first year we were married. While most folks write a little blurb about what each family member has been up to since last Christmas, my format is a bit different. I do twelve little blurbs, hitting our family highlights for each month of the past year. When I’m finished, I send them out with my Christmas cards. I also keep a copy and put it into my “newsletter notebook.” Now, we have a complete family history. My kids love reading back through them every year, and it has also been helpful to us for record-keeping and filling out forms (remembering which year we moved to a certain house or when a child sustained a particular injury, for example). 6. I’m glad I didn’t do a “theme tree”. I have seen some absolutely gorgeous Christmas trees. There’s a color scheme. All the ornaments match or coordinate. Maybe there’s a sports or regional or literary theme to it. My tree kinda looks like a tornado hit a pre-school, made its way through a Hallmark store, and sucked up a souvenir shop before landing in my living room. And I wouldn’t have it any other way. There’s a memory attached to almost every ornament. The ones from my childhood. The ones we bought on our honeymoon and the time we went to Disney World. The ones the kids made in Sunday school. And all the children have certain ornaments that are “theirs,” (we mark them with their initials and the year) that they made or that were given to them. And one day, when they grow up and get married, one of their wedding presents will be a box containing all of “their” ornaments to hang on their own trees, so they can take some memories with them. 7. I’m glad we have some family traditions that are unique to our particular family. There are some traditions that are common to lots of families, but it’s the ones that no other family on the planet does that can be extra special. For example, last year, after we got home from our annual family outing of picking out our tree, we sat around the table together and had hot chocolate. And chips and salsa. (I know. Weird, huh?) My 12 year old remembered this a whole year later and begged to do it again. It’s those little things that go the extra mile in binding you together and giving your family a unique identity. 8. I’m glad we handled Santa Claus the way we did. We decided before we had children that we would not lie to them about the existence or omniscience (he sees you when you’re sleeping, he knows when you’re awake, he knows if you’ve been bad or good, etc.) of Santa Claus. The Bible says that lying is a sin, period. There’s no exception for jolly old elves who pass out toys (or for tooth fairies or Easter bunnies, for that matter). But there’s nothing wrong with the fun of Santa as long as he arrives on the scene without lies or claims to attributes only God possesses. So we sang Santa songs and told Santa stories, but on Christmas Eve, our children knew it was Mom and Dad filling the stockings. When they were very small, my husband or I would don a Santa hat and say something like: “You know how you like to play pretend? Well, mommies and daddies like to play pretend, too, especially at Christmas! Now it’s time for you to go to bed so we can pretend to be Santa Claus.” So far, no one is in therapy from us handling the Santa Claus story this way, plus there were no conspiracies with the older children to keep the secret from the younger ones, and no moments of devastation as each child grew up and found out the truth. What are some things you’d like to do over -or do over and over- at Christmas with your family? My husband and I don’t have children yet, but we already talk about these things, and they roll around in my head every year at Christmas. Right now we are making family traditions with just the two of us, in hopes of having them “securely in place” by the time any children arrive. We want Christmas to be about Jesus rather than Santa and gifts, and have already decided that we will probably “skip” Santa altogether. But we’ve talked about limiting gifts to 3, tying the symbolism to the 3 gifts Jesus received. Advent wasn’t part of our lives either, growing up, but I’ve been trying to get that started in my own heart for the past few years in hopes of making the transition easier. I confess I have a theme tree, but it’s not our main tree. 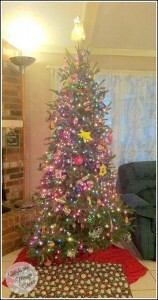 Our main tree is a lot like yours, minus the children’s ornaments. We call it our “traditional” tree, but you could just as easily call it our “memory” tree, because as you said, each ornament has a story. My theme tree is a smaller one that I decorate with bird ornaments. Our dining room has a sort of bird theme, and I think songbirds are pretty, so I put a small one in there. My favorite, though, is giving experiences as gifts. 🙂 That’s something we definitely want to do. I love how you handled Santa Claus. That’s exactly how my parents did it when I was a girl. I can still hear my dad saying, now who wants to play Santa Claus. Such fun times we had as a family and never once did I feel deprived because Santa didn’t deliver my toys. Thanks for sharing this post. LOVELY post! 🙂 I’d like the Christmas to get less about pressies etc too..
And great to read your experience about having baby in December! A friend of mine had a baby recently and I’m pregnant (due date in March) and I thought on so many occasions that it would be SOOO lovely to have a baby in December kind of like a Christmas gift from God, right? It’s so sweet to have a little baby on Christmas days.. There is so many positive emotions and great warm atmosphere around Christmas.. but you are right.. when they grow up a bit.. people are just so excited about Christmas that birthday isnt so special as it could be then.